For the last week or so, I’ve been preparing like a madwoman for Yarn School and getting the fiber club dyed and out. The fiber club shipped fully yesterday (I haven’t had a chance to enter all your tracking numbers into the database, but you’ll get them soon) and Yarn School preparations are winding down. I might actually breathe properly soon! I was calm enough last night to cast on the body of Cobblestone. This is going to make super excellent airplane knitting on Tuesday. The sleeves are done. Wanna see? I’ve got my waist shaping planned and my yoke yarn wound and ready to go. The body numbers had to be fiddled with a bit, as I’m knitting the smallest size, but I’m a bit hippy and bewbsy for the lower body, though the arms and yoke are fine. 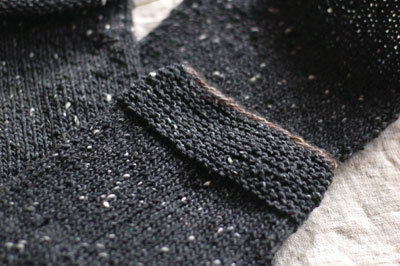 There’s only an 8 stitch difference, so the yoke fudging, which will be done on the fly, should be fine. It will be ready for Rhinebeck. I’ve been preparing and collecting spinning samples for Yarn School and one thing that was missing was Navajo plying, which I’ll be teaching. So, I dug out a bit of hand-dyed BFL wool top and pre-drafted it without splitting so that the color repeats would be nice and long. I spun and Navajo plied it into a bulky, amazingly puffy yarn that acted like a spring when stretched. The resulting yarn was the stretchiest, bounciest, and softest BFL yarn I’ve ever spun. I knit it into a top-down hat (no swatching!) and watched the stripes appear. I’m going to have to Navajo ply more often. I’m leaving for Kansas and Yarn School on Tuesday the 25th and returning on the 1st of October. Any orders and emails placed after Sunday won’t be dealt with until I return. I’ll put a notice across the top of the shop to be sure everyone knows. When I get back, there is a glut of new yarn bases and fibers waiting for me to dye them. I’m going to have all kinds of new lace and sock yarns, and great yarns for sweaters, as well. There will be a bunch of new wools and blends, as well. The next fiber club will go up for sale in mid-October. I’ll post again about that, but mark your calendars if you’re interested in joining. I don’t think I’ll be able to increase the number this time, with the Christmas rush happening in the middle of it. Maybe next time. Have fun on the internet while I’m out of the loop! I love Navajo plying- great hat. Your Cobblestone is going to look great! I’d love to make one but with mods so it doesn’t look baggy on me. Looking forward to see what you do with yours. Would love to join your Fiber Club. Is it on a first come first served basis or is it offered to current members first with a waiting list? I am so jealous of yarn school! I bookmarked it and when I went to sign up a few weeks later, it was full! Oh well, I’ll try again next year! Maybe I’ll bump into you at Rhinebeck! have fun! and i got my club fiber. so pretty! I’m so sad that I couldn’t go to Yarn School this year. Perhaps next. Sigh. Have a grand time! What a beautiful hat. I need to learn to properly ply. Again, I sigh. Safe travels! Waaah, Yarn School! Have fun on all of your adventures! I also enjoy “bewbsy.” Tee hee. Navajo plying and Nikol’s cooking? aw c’mon. i’d quit my yarn shop just for that. say hi to any ’06 alums for me and have a great time! I should have done my sleeves first too – you are just moving along and I’m just not. Can I have your sleeves, please? The hat looks awesome, yay navajo plying! It’s so clever, I love it. Your cobblestone looks gorgeous, too. Can’t wait for Rhinebeck, eeee! The striping on the hat is beautiful. I’m loving that hat and am wondering what top-down method/pattern you prefer? Care to share? Cobblestone is looking good. The Navajo-plying worked out beautifully. Have a great trip. Enlighten people! LOVE the hat!!! i’d had never thought of this technique for stripes – genius!! The Cobblestone is looking lovely. I just started spinning but I’m fascinated by the Navajo plying, the hat turned out lovely. Hope you’re enjoying your time away! 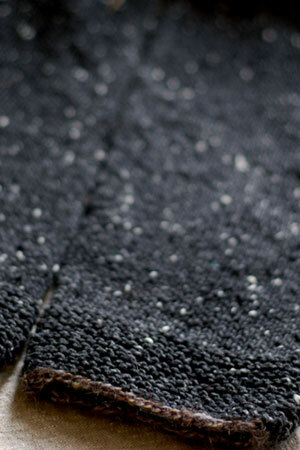 I’m looking forward to seeing your Cobblestone with the handspun. 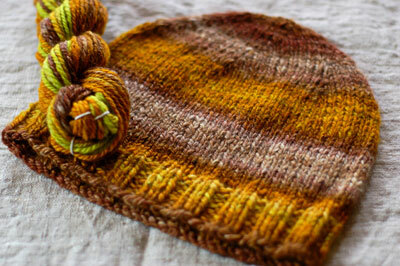 The hat looks great; I haven’t Navajo-plied in a while, I’ll have to add it back to the roster. Have fun at Yarn School! I love the yarn you chose for Cobblestone! It’s beautiful! Are you allowed to knit on an airplane? I wanted to on my last trip, but my travel agent said it wasn’t a good idea to bring the needles on the plane. ARgghhh. That hat looks lovely. I recently figured out how to Navajo ply and am working on a Sheep to Shoe kit. I love the hat! That yarn is absolutely gorgeous. I hope you sell stuff like that in your shop, cause I’m goin’ there next!